Saturday is right around the corner, what's it going to take for a W on watauga? I'm thinking about 17.25 with about a 4.5 smallie for the big fish. 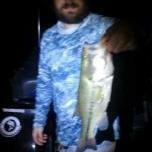 19.03 with a 5.54 green one. I concur with this one. Sounds like it should be a fun one then!! !